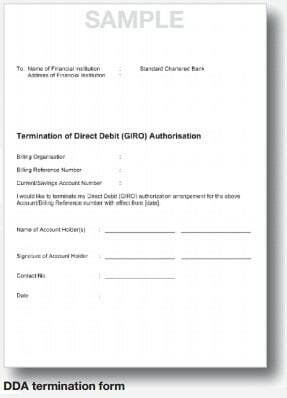 A direct debit arrangement – also commonly known as a GIRO or automated clearing house (ACH) direct debit – is a service provided by Standard Chartered Bank to you, our corporate clients (billing organisations), to facilitate the collection of monies due to you for services provided. Through direct debits, you will be able to debit your downstream client’s/buyer’s designated bank account to collect fees due to you on a regular basis. As a billing organisation, you will have to provide your buyers with a document through which they can authorise you to debit their designated bank account to pay for the outstanding bills. Please contact your local Client Services Representative to obtain the relevant form for your country. You may customise the application form by printing your organisation’s logo and/or including marketing messages to suit your business needs. Additionally, you can also pre-print your organisation’s name and bank account number on the form. However, to ensure that the format does not differ too much from the prescribed layout, we advise that you send the form to Standard Chartered Bank for review before printing in bulk. • Check and verify that the application form has been duly completed and that the mandatory information has been provided. 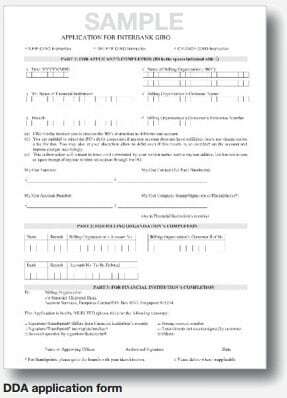 • Batch all the application forms received by paying bank. • Send the application forms to the relevant paying bank. • Where the designated paying bank is Standard Chartered, please click here for the address. Standard Chartered Bank will check and verify the payer’s account details and ensure the authorisation is in order before advising the billing organisation that the DDA form has been accepted or rejected. • The billing organisation is expected to capture the payer’s information in the accepted DDA form in their financial/billing system. This information can then be used in the direct debit instruction which will be sent to the buyer’s bank to debit the buyer’s designated bank account to pay for their bills on a regular basis. • Generate a DDI file which contains the payer’s bank information and amount due, and upload the file through Standard Chartered’s electronic banking platform, Straight2Bank. The successfully uploaded instruction will be processed by Standard Chartered Bank accordingly. To obtain the file format for your country, please contact your local Client Service Representative. Status of the instruction can be viewed on Straight2Bank. You can terminate a direct debit arrangement by providing written notification to the billing organisation to stop sending direct debit instructions to your bank. You should also notify your bank in writing so that they will not accept instructions from the billing organisation to debit your designated account further. Please contact your local Client Services Representative to obtain the relevant direct debit termination form for your country.